Apps and devices will evolve and tools already around us will become instruments of health to advance tailor-made care delivery and treatments. 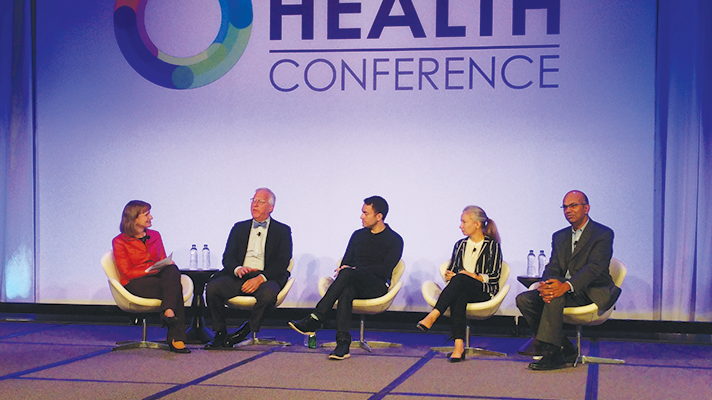 BOSTON – Speakers at the Connected Health Conference here on Friday gave a glimpse of the personalized health that wearables are beginning to enable – and offered some predictions about how the apps and devices will likely evolve. A wide number and variety of wearable devices today are already collecting large amounts of data. Fitbit medical director Dr. John Moore, for instance, said it has information about billions of nights of sleep and trillions of hours of step taking. Sensors are in place and monitoring is already happening, said Dr. Robert Grenfell, director of health and biosecurity at CSIRO, a federal scientific research organization in Australia. "We have components of this already, but imagine it seamlessly fitting together," Grenfell said. "At the same moment, we are not precise and we’re not engaging people in what they’re actually doing." The data, compute power and digital health tools are now available to make dynamic systems. "We are now seeing the information along with medicine providing the potential for better health outcomes," said Divakar Ramakrishnan, chief digital officer of Eli Lilly. "The devices, wearables, sensors – when you take that info along with fairly expensive drugs, we have the opportunity to get the right medicine to the right patient at the right time." Anna Kravets, director of business consulting at Merck, added that apps, devices and sensors create a digital expression of patients. "Precision medicine is the ability to make medicine dynamic and learning," she said. "A human is not a static system. Even if you design something for me today, the way I react may be different tomorrow." Apps and devices, even those that today are state-of-the-art, will also change moving forward to deliver more context, said Peter Bergethon, vice president of quantitative medicine and clinical technologies at Biogen. "Wearables will be sensing, not wearables as they are now," Kravets said. She pointed, for example, to smart toilets processing and analyzing specimens on-site. "Tools around us will start to be instrumented to collect knowledge." As wearables evolve, new apps and devices emerge, the need for standards to exchange that data across platforms and products will arise, Bergethon said. Other challenges will invariably emerge, too, including access, availability and cost. "How do we make sure nobody is left behind?" Grenfell said. "We need to be looking toward health for all because the richness and success of society depends on it."